How do I customize the type of events I send to my volunteers? You can now also use our URL generator to create a custom pre-filtered URL to distribute to your volunteers. Need more? 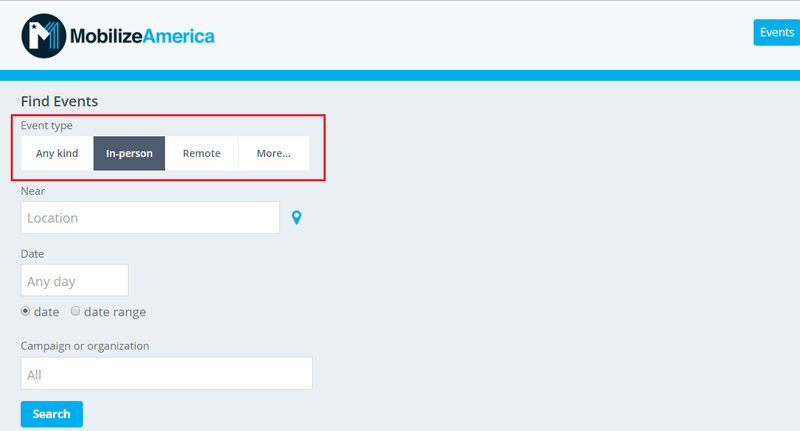 Here's how you can pre-filter your feed by state or zip code, dates or date ranges, or organization. 2. Filters sit at the top of your feed. Click anywhere to open up the detailed filter. 3. Filter by event type: Under event type, select 'in-person' to promote all in-person events and 'remote' if you want all remote events. To select specific types of events (e.g. remote phone banks only), click 'More'. Please note that promoting both in-person and virtual events is not currently available. 5. Select ‘search’ and copy the link displayed in the search bar of your browser. 6. You can now share this link via email or SMS to direct volunteers to a pre-filtered feed, displaying only the types of events(s) you selected.